Sister Agatha was a member of the Anglican Order of the Sacred Heart at Gwenafwy Abbey in the North Border Country in Wales which she had first joined as a postulant 40 years before. `She had grown up on her family's sheep farm, not 300 yards from the front gate of the Abbey, then, after the death of her mother she had found that "there were two things that she truly loved - the cheerful sisters in their long black habits and the companionship of a good book." She had taken her vows at the age of 19 and since then "had hardly left the Abbey" where she now serves as librarian. She was starting to feel her age: she stll had green eyes, but "the edges of her face had gone soft and wrinkles spread in tiny reefs from the corners of her eyes. When she pulled off her veil at night, she half expected long red hair to tumble out, but her hair had been short and gray for years now." Her favourite pastime was reading mystery stories, to which she constantly refers, and she was proud that she shared Agatha Christie's Christian name She was writing her own mystery novel too, featuring "a gumshoe detective named Bates Melancthon, who tended to shoot first and ask questions later". She was allowed to do this because "when each nun at Gwenafwy Abbey turned 60 years old, the other sisters did whatever was needed to allow that particular sister to realise whatever dream she might have long held." So the sisters had paid her tuition at the University of St David's so she could become Master of Fine Arts in Creative Writing! Father Selwyn was the vicar at St Anselm church in the village of Pryderi where the Abbey was also situated. He had been "Sister Agatha's best friend since primary school" so was about her age, then when he was twenty, in the same year that she had taken her vows, had studied for ordination at Trinity Theological. He had a large frame and long legs and was an angling enthusiast, claiming that his yearly fishing trips to Scotland were biblically mandated." He had recently had to give up his beloved cider in favour of a "murky green liquid" smoothie. His eyes were "deep green behind wire spectacles" and "communicated warmth and genuine kindness. His grey hair has advanced over the years from thinning to uncontested balding. Having been an avid rugby player before blowing out his knee in the village game, he had a slight paunch that not even a long black cassock could hide.Nice-looking - in a comfortable way - Father Selwyn often said that he enjoyed life abundantly and that abundant life included cheese puddings, Glamorgan sausages, and whortleberry tart." He proves to be "the perfect sideskick" for Sister Agatha who does all the real detective work. 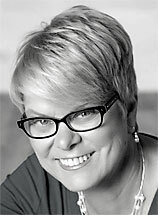 Rev Jane Willan is Pastor of the First Congregational Church of Paxton, Massachusetts, United Church of Christ, where she lives in the old parsonage with her husband and two rescue dogs. Before becoming an ordained pastor in 2003, Jane had worked in Boston as a science editor, a freelance science writer, a teacher, and had a brief stint in biological research at Harvard. She has a Master of Science degree from Boston University, and a Master of Divinity from Vanderbilt Divinity School. 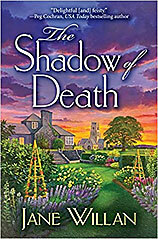 The Shadow of Death (reviewed below) was her first novel. The sisters of Gwenafwy Abbey (of whom only 19 remain at the start of the 21st century, and they have an average age of 73) rely for revenue on their home-made award-winning organic cheese, Heavenly Gouda. When the Abbey's sexton is found dead under an avalanche of gouda, Sister Agatha is convinced it is murder, even though the local constable is sure it was an accident. Following advice from Inspector McFarland, whose weekly podcasts on crime-writing she scrupulously studies (and insists on telling us about), and, with repeated references to her favorite fictional detectives ranging from Hercule Poirot to Stephanie Plum, she is determined to solve the death of Jacob, save the Abbey, exonerate a beloved postulant, and restore the good name of their cheese. So she carefully lists all possible suspects, even including her old friend Sister Callwen whom she had known for 40 years (but "she had to admit, Sister Callwen was looking disappointingly normal, with no overt signs of suspect-like behavior"). She also lists all the clues she can think of in one of her expensive new notebooks that Reverend Mother had approved of, even if they were "somewhat at odds with her vow of poverty". But then she seems allowed incredible freedom throughout. One of the things that attracts her attention is when she spots new arrival Sister Gwennydd getting out of the car dressed "in a tiny black dress and heels instead of a blue habit and trainer". She realises something may be amiss. In fact Sister Gwennydd was feeling a bit guilty about murdering her boyfriend. On reflection, she thought "poisoning him was probably going too far." It is is all quite fantastic. Even so, some of the characters are quite entertaining. Among these is the new Bishop. She was "tall and striking" and "absolutely imposing in bishop's clericals". She's a truly tough cookie, though,and is quite prepared to close the abbey if they cannot pay their way. So much depends on the cheese production that it is a major setback when their storage barn catches alight. But never mind, old Bartimaeus, their blind Shetland pony is led to safety, and Sister Agatha asks herself, "What was going on here?" And a few scenes are quite moving, as when Reverend Mother reassures Sister Gwewnydd, "Don't worry, I will stand right beside you. And then - with their help - because we are a community of faith not just a group of people who happen to live together, we will get to the bottom of this .... You have been called. Called by God .... I don't say this lightly, but ever since you came through our doors, I have known you were responding to God's call." "Even though I was running from something?" "Good heavens. We are all running from something." If only there had been more real conversations like this one. It ends with Sister Agatha miscalculating and getting a gun in her back - but guess who rescues her. Could it be old Bartimaeus, the blind Shetland pony? It is quite the coziest of cozy mysteries set in a completely implausible Welsh village (in which, at one stage they even start talking in dollars, there Is a reference to the "the men's room", and one of the characters says, "I had only just gotten my credit card"), complete with a stock character dim-witted village constable. It seems such a pity that an author with such a wealth of personal clerical experience to draw on chose such an unconvincing setting. The cover is nothing if not colorful.